I’ll be upfront: I don’t drink coffee, so I don’t know if that makes me ineligible to be seeking a coffee replacement. I do drink tea, though, and I’ve noticed chicory root while casually reading the ingredients on some tea labels. 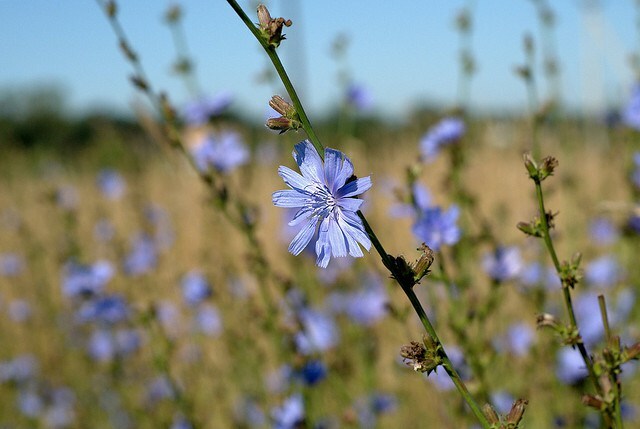 Never really paid it much attention, until I figured out that those ubiquitous blue flowers found along roadsides and in empty fields are the same chicory that’s in my tea (okay, probably a different variety bred for bigger roots, but same family). And of course, the slightest whiff is enough to send me off on my next pursuit, so in that instant, I decided we (okay, I) were going to dig up some chicory, roast it, and drink it. Once you find your chicory, you have to dig it up. These suckers have long, tough roots, so it’s best to (at the very least) stick a trowel in the ground close to the base and wiggle, to loosen up the soil a bit. If you just yank, there’s even odds that you’ll just rip the top off, and leave the entire root in the ground. Collect a few, making sure to leave some plants to reproduce (and some for those neighbors, just in case). Cut the tops off, and scrub the roots under some water to get all the dirt and grit out of those tight spots. Now for the roasting. 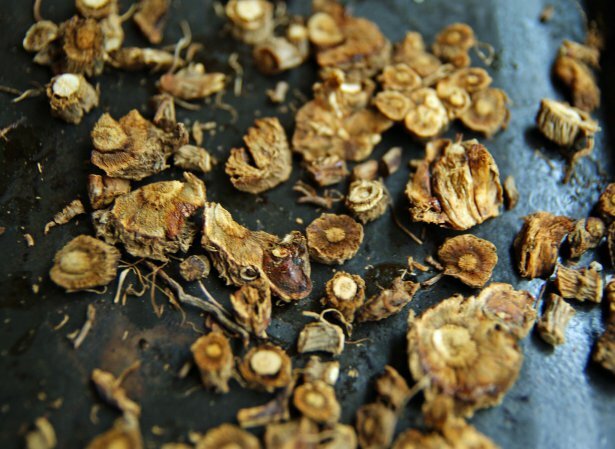 Slice the roots up into 1/4″ pieces. There might be a few tough sections, but shouldn’t be too bad. Place them in a single layer on a baking sheet, and pop them in the oven at about 325 F for a couple hours. Time isn’t going to be exact, just check on them every once in a while. They should be browned, crispy, and fragrant. Really, if you snap one and smell it, it’s almost exactly like freshly ground coffee. Weird, because it doesn’t smell or taste like much of anything when it’s fresh. 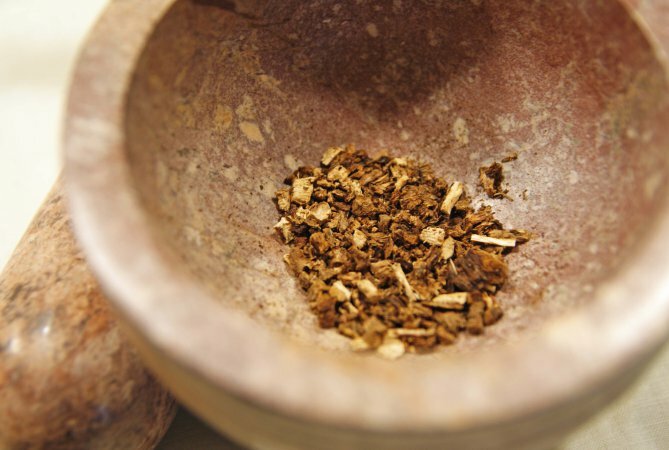 I used a mortar and pestle to pulverize the dried roots, but you can stick them in a coffee grinder too. When they’re ground up, either prepare them as you would a regular pot of coffee, or do as I did and put them in a tea strainer and steep in boiling water for several minutes. The chicory coffee drink has a unique, almost chocolatey flavor. S, being the resident coffee drinker, verified that it did indeed make a passable substitute for her coffee, only with more of a cocoa overtone. Heck, if coffee tasted more like chocolate, I’d probably drink it. It’s actually enjoyable enough that I may look for a variety specifically grown for big roots, and plant a few next year. We’ve just about got all our beverages produced on site now too. If I can find a sassafras tree around here and whip up some homemade root beer for S, we should have it pretty much covered. And if you must have real coffee, at least make sure it’s a healthy coffee! I pretty much don’t drink anything but New Orleans-style coffee with chicory, but I’ve never tried straight chicory. My grandpa used to make his own root beer. It was apparently bad enough that his kids preferred shaking the bottles and spraying the contents all over the cellar in favor of actually drinking it. He was pretty mad when he found out. I’m sure yours will be better. great post! 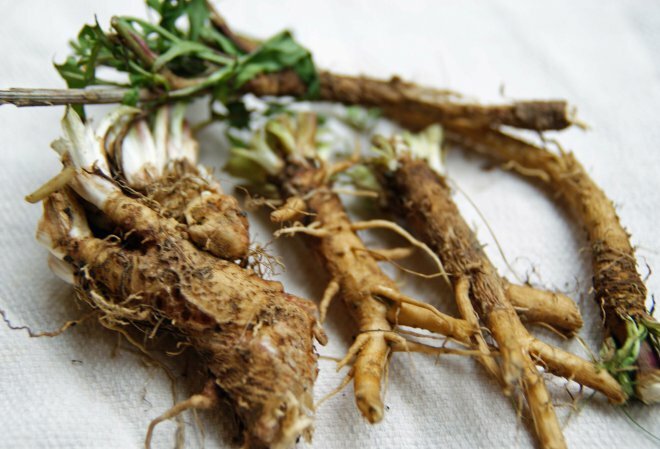 we have it growing all over the place here, I was thinking about roasting dandelion roots and chicory to make a tea ‘coffee’ blend as I’ve purchased that combination before. I do find it tastes similar to coffee, especially with milk and sugar.